This is a creamy, delightful soup with the roasted flavour of pumpkin, onion and fennel seeds. Fennel is an aromatic herb belonging to the parsley family. It is used as a spice and possesses a sweet taste that is similar to anise. It is an essential ingredient in the Mediterranean cuisine. It is native to the South European region but is consumed well in all of the European regions. It is a two meter plant with dark green leaves and yellow flowers. Fennel seeds are generally eaten for the taste but also very healthy owing to the nutrition value attached to it. If your goal is a healthy, nutritious diet, add pumpkin to meals regularly. A low-calorie vegetable that provides nutrients, fiber, vitamins and minerals. Pumpkin can help keep your digestive system regular and your other organ systems healthy. It also produces nutritious seeds that are tasty snacks and contain an oil with additional health benefits. 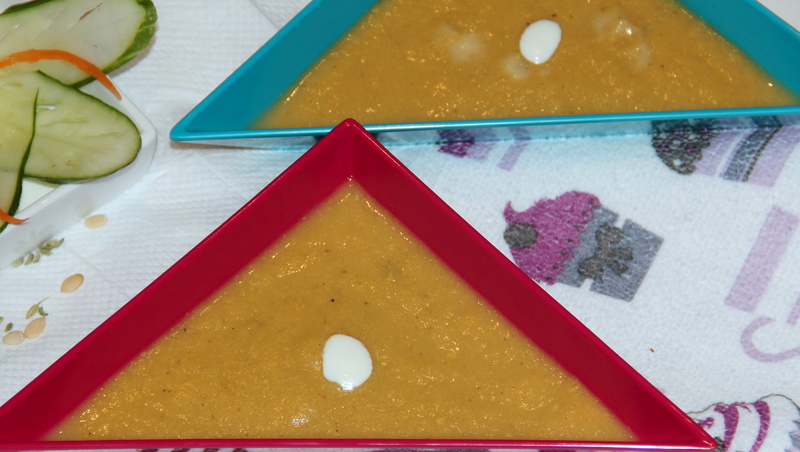 Place diced pumpkin, onion, garlic, pepper corns on a lined baking tray, toss with olive oil, sprinkle with salt. In a skillet or a heavy bottomed sauce pan toast the pumpkin seeds, fennel seeds until fragnant and crackling, about 4-5minutes-set aside and let it cool. Once cooled combine pumpkin seeds, fennel seeds, roasted pumpkin, onion, pepper corns, garlic and blend it to a smooth puree using some water while blending. Heat olive oil and add in the pureed mixture into the saucepan , add in milk, 1cup water and simmer for 8-10minutes. Adjust the consistency as desired to thick or thin and salt as per taste. Posted on October 17, 2014, in International, Soups, Salad and Wraps, Vegan and tagged Chitras healthy kitchen, drchdietfood, Vegan soup recipes. Bookmark the permalink. 12 Comments. Love pumpkin and pumpkin seeds, your soup is so nice and I think the fennel is a brilliant addition. Mmm such a good dinner idea. Sold! Looks so creamy, pumpkin texture automatically brings this delicious I guess 🙂 Lovely!!! I have pinned this recipe to our Pinterest Board. Thanks Kimmy for your support. Please pass the pinboard link and will follow that..